This is the third compilation in the Snow Robots series. 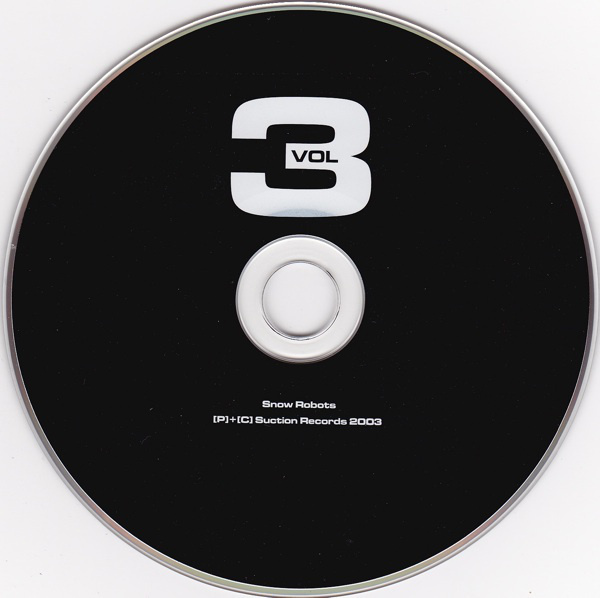 While the first two volumes (released in 2000) served to highlight Suction Records' first three years on the scene, "Snow Robots Volume 3" serves to forecast Suction Records' future. This includes selections from our next seven releases, along with several exclusive tracks, all tasters for Suction Records' ever-mutating sound. From the pure melodic electro stylings of Lowfish, Skanfrom and Orgue Electronique, to the unique vocoder anthems of Solvent, Tinfoil Teakettle and The Mitgang Audio and from the dark, Rephlexian electronics of David Kristian and Laurent Boudic (recorded in 1980! ), to the classic vocal synthpop sound of Black Turtleneck and GD Luxxe, "Snow Robots Volume 3" wholly encompasses the future sound of Suction Records.